Cultural factors, such as effective interaction among employees and between employees and customers, as well as collaboration on problem-solving, were much more important than financing or product characteristics. Let’s take a look at these, and how they interplay with your company’s innovation system and strategic growth initiatives. If your company’s growth is inconsistent, you could be set up for a fall. As we see it, those kinds of results can indicate an approach to growth that is not systemic, but depends instead upon unique circumstances that lead to a quick hit, followed by lack of capability to consistently execute on new programs, an inability to balance the needs of new initiatives with those of the core business, and/or a culture of complacency that can follow success. We suggest a couple of actions to get you started on a high-level analysis of your growth profile. First, take a look at how your growth rate tracks over the last five to ten years, and how you are projecting it into the future. Has it plateaued? Are you forecasting a big bump next year, or have you just experienced one? As a benchmark, the companies highlighted in the Inc. Build 100 list have grown at an average annual rate of 35% over five years. That kind of consistency is not easy to achieve. According to the stats reported, fewer than 2% of companies researched have been able to grow headcount every year for five years. So it’s unlikely you will match those results, but focus on the consistency of your growth profile. How would you describe your organization’s approach to innovation? New offerings are sporadic, mostly improvements to existing offerings, and/or are chosen based mainly on short-term ROI. Our portfolio of new offerings presents major extensions to existing lines and/or new-to-market value propositions; they require investment, and are slated for near- or mid-term profitability. We consistently launch new offerings that create new market segments, have a long growth horizon, and have the potential to spin off new businesses. How is funding for innovation and new ventures managed? We determine what to spend on new ventures on a one-off basis, depending on a detailed projection of capital investment and ROI. We actively manage a project portfolio that is overseen by top execs and the CEO; we allocate resources as needed to spin off the best new disruptive offerings. If your answers lean more toward A than toward C, you may be in a position where organic growth from new initiatives is not systemic, and therefore unsustainable. As the study points out, culture is important—more so than technical achievement, financial resources, or other more tangible factors. While that’s not a breakthrough revelation for most people in business, it can be a tricky one to own and a difficult one to influence. Here’s a new twist on the drivers of cultural change and collective innovation. 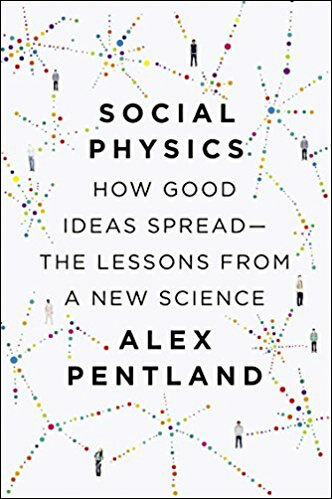 In his recent book Social Physics: How Good Ideas Spread—The Lessons from a New Science, MIT’s data maven Alex Pentland lays out the findings of his innovative research into how large groups of people interact, their collective intelligence, and how ideas spread, all of which may be useful to anyone interested in understanding and influencing the culture of an organization. It’s based on two big data studies covering millions of hours of interaction data over two years and probing how humans find and incorporate new ideas into decisions. Social learning, or copying one another’s successes, combined with individual learning that happens in a more isolated way is dramatically better than individual learning alone – you need both. Diversity is important; social learning alone can lead to dangerous “groupthink.” If social networks and your individualists are all in sync, you could be in what Pentland describes as an “echo chamber.” And regardless, you need to be pursuing diverse strategies (reference answer C to question 2 above). As covered in our feature article in our Strategic Innovation Newsletter #13, Service Innovation—“My Job Is to Build a Culture of Innovation,” the top leader or leaders cannot do it all – it takes a village of innovators, and CEO-innovators know that; they energetically seek out and surround themselves with people that have different viewpoints and ideas, and they create communities of experimenters. What best describes your organization’s innovation culture? We focus on managing day-to-day operations and maintaining existing processes; new ideas that fall outside our comfort zone are not encouraged. We look for best practices and new ideas inside (and sometimes outside) our industry; idea systems in our company yield some success, but don’t generate much in the way of big new concepts. Collaborative networks of people, inside and outside the company, actively seek new ideas coming from anywhere; we engage directly with customers to deeply understand their jobs-to-be-done. How does your organization manage innovation? We have a traditional, departmental R&D approach to managing any new or improved offerings. We have a standardized system for managing ideas and funneling them to the appropriate management structure for consideration and follow-up. We allow new ideas to develop organically through informal collaborative networks before they emerge into our portfolio management process. If your company environment sounds more like A than like C, it’s time to start taking responsibility for changing that. One of the most innovative organizations on the planet is not a private enterprise, but a government agency. Surprised? Well, that's exactly their mission: creating and preventing strategic surprise.